The one thing I love most about knitting, and I’ve probably said it a hundred times by now, is that it wipes away all my stresses. It’s hard to think and focus on all the bad when you have to keep track of your stitches, especially lace repeats. It’s therapeutic. So that’s how I started my morning. 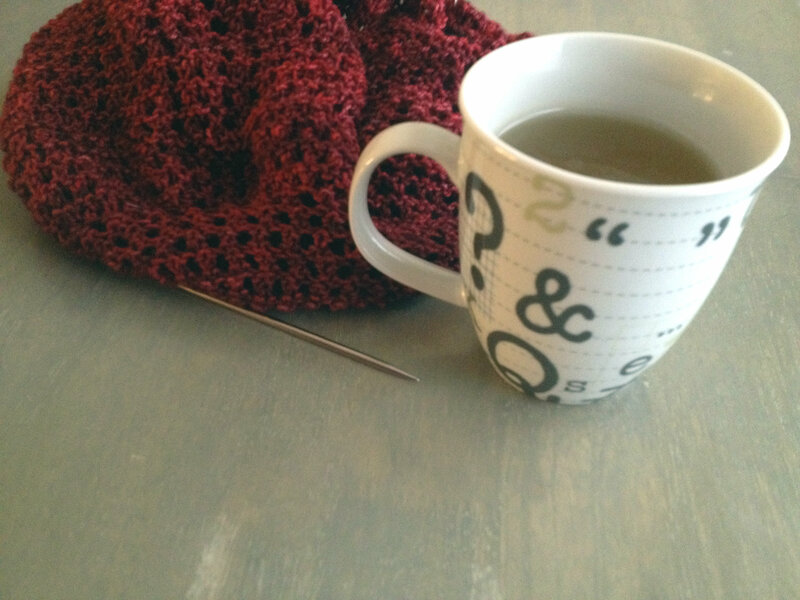 I brewed a cup of green tea (though it looks brown) and curled up in the corner of the sofa with my knitting. It took my mind off all the worries I’ve been faced with lately and chilled me out. After all, I’m messing enough up on this project without adding getting distracted by stress on top of it. And oh the mistakes I’ve made! Somehow, no matter how hard I try, each lace round either ends with one too many or one too few stitches. I have no idea what’s going on. I’ve counted and recounted my stitches over and over again. I’m not sure what’s going on. Hopefully the project won’t look too crazy in the end. I just don’t feel like ripping back and starting this section over again. I did think about picking up the yellow shawl and working on it for a little while to take a break from the craziness. The yellow shawl is really easy and is just feather and fan every few rows. I’ve had practice with mom’s shawl, so it shouldn’t be too bad. I might just do that this evening. Plus, it’s always nice to have fluffy Malabrigo in my hands. Perhaps that’s why I keep so many projects as WIPs, so I can switch between them when one gets too stressful for me to handle. I’ve even been eyeing those lace socks I promised to someone. They’re finally at the increase for the gusset, so not far from the heel at all! So much to consider. What are you up to in your projects? I’m in sock mode, although I feel a bout of Teknika gloves (http://knitty.com/ISSUEwbis11/PATTteknika.php) coming on. I think they would be fantastic Christmas presents for just about everyone I know (with a smartphone, natch). Random question — how do you wear your shawls? Do you wrap like a scarf, use a shawl pin? I never am quite sure how to wear them without fussing with them all the time. It depends on the size of the shawl. If it will wrap around my shoulders, I just wear it like that with it draped over my arms. If it’s a smaller or shorter shawl, I wear it like a scarf. I haven’t tried using a shawl pin before, but I have been starting to notice them. There are some really pretty ones out there!